Handmade fused glass cabinet door knobs made for you in my Portland glass studio. This listing shows the six colors of solid blue knobs that are currently available. These are made to order and can be ordered in quantities for your renovation project! Please contact me with any questions on multiple quantities before you place your order, so that any applicable discounts may be applied. Not sure exactly which color will be your best match? You can order a color sample of any colors you want to try (without the base) for $2 each on this listing. Knob size is 1-7/16" on a 16 mm high base (approximately 5/8"). Knob base is threaded for a standard 8-32 knob screw to a depth of 1/4". Each knob purchased includes a standard 8-32 screw. Four base options are available in any of the colors you choose (all are shown here with satin nickel but any of these colors can be made with other base colors shown here). This listing is for one of the 1-7/16" square single knobs. Discounts for certain quantity levels may be available, so contact me with any questions on discounts. Please allow at least 2 weeks to complete your order if you are ordering in large quantities. 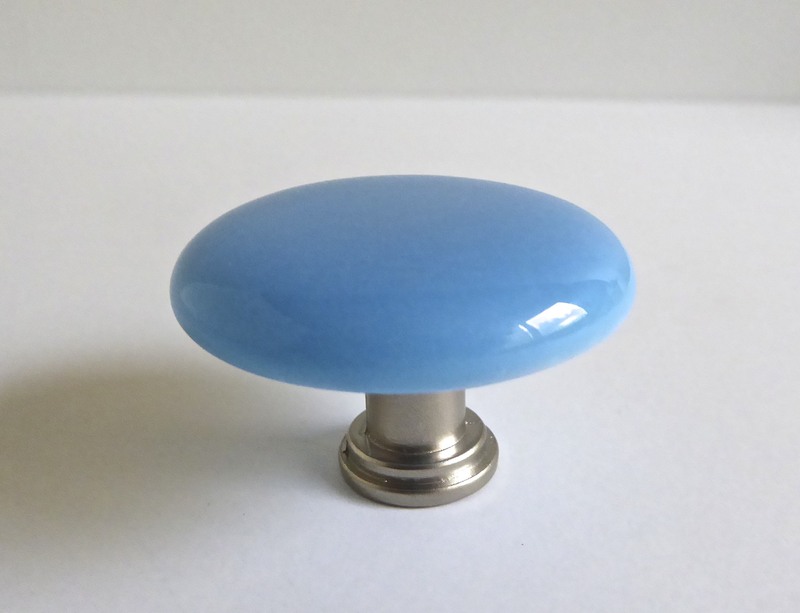 These fused glass knobs are hand cut and fired so each one may be very slightly different. In addition, variety within the glass itself including streaks or waves is possible in fused glass and small champagne bubbles are also normal. For matching drawer pulls that are 1-7/16" by 4-1/2" see the last two photo and shop link here. These may also be available in 1-7/16" diameter round knobs, on request (not in stock). See example here. Email me at bprdesigns.glass@gmail.com with any inquiries. All cabinet knobs and pulls ship USPS First class, not Priority Mail, unless PM is more efficient for an order for a large quantity.